Sir Calvin thanks you all for your very kind Birthday wishes - they were such a treat. 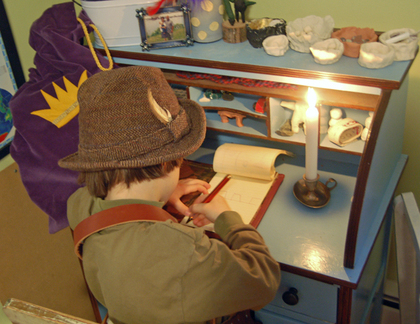 Here he sits by candlelight (at 2 o'clock in the afternoon), composing a letter to his 'dear mother' about his grand travels through the forests of England, where he is doing good deeds as a knight errant, much like his new hero, Don Quixote. And oh my, the similarities between Calvin and dear Don! Or, better yet, Squire Ezra and Sancho? I can barely contain my giggles as I read this story to them. Cardboard visor? Got that! Dry wit and sarcasm from the squire? Got that too! Thank you, Lizette, for pointing out how perfect this tale is for my boys! And for me, who is amused to no end by it all. And this. After years now of stumbling upon sights such as this, it still continues to startle me from time to time. 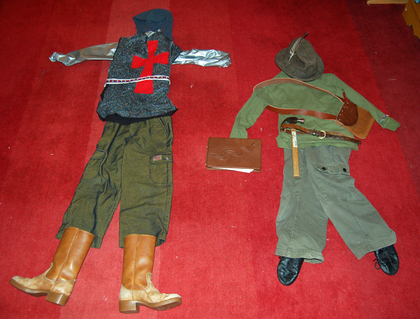 Especially now that he's planning ahead by laying out the first outfit of the day (brave knight) followed by the second (a woodcutter, of course). Thinking ahead, you know. A planner, and a lover of the details. (A boy after my own heart...which I suppose is why we make each other completely crazy, all at the same time as completely 'getting' each other like no one else). There's something about all this imaginative play that seems to affect all of us in a very good way. 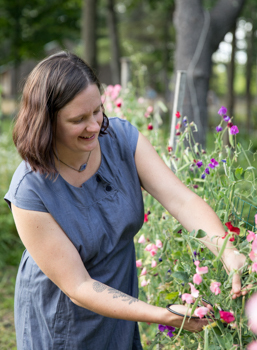 Besides being a natural way to learn about so much (it's been my perfect 'homeschooling' foundation), it's also a natural way to connect with each other. And to create with each other. Sometimes it's so easy to get caught up the mudane moments of the minute-to-minute, day-to-day aspects of parenting. I know that feeling very well. But I am ever so grateful for those other moments, the ones when we're in the midst of connection and play: I'm in the "manor" preparing a feast for my tired and very brave knight and his squire, who come riding in on their 'horses' with their hysterical 'accents', and a little princess trailing behind on her own horse (the cat). And I'm laughing. And they're all laughing. And I have that amazing moment where I think, is this real? is this really what I get to do with my day, with my life?